What Can One Person Do About Global Warming? Join the 30 Day Activation Series Today to learn what you can do to Reverse Global Warming with solutions that exist TODAY. "When the Self emerges, the ego takes a hit"
I knew before the trip that the Aschuar interpret their dreams at four a.m. and we would be invited to join them. What I did not know was that we would face this same treacherous jungle trail --only this time, it would be in the dark and in a downpour . We retired early the night before in anticipation of a three a.m. wake-up and hike to the home of one of the Aschuar families. We were instructed to bring our dream and they would interpret them. 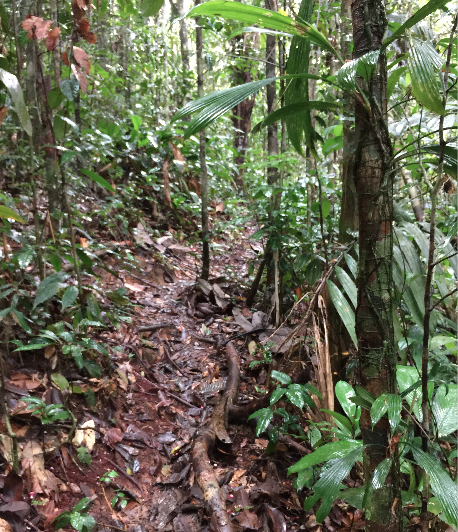 It rained all night long.. and I kept waking up, growing increasingly anxious about that hike through the jungle in the dark. I told myself i was worried about Loretta (I was). But i was just as worried about ME. I decided that if I did not receive a dream, I would stay at our camp with her should she decide to stay. At three a.m., one of our campmates reported to Loretta that the guides were considering cancelling the trip because it was too treacherous. As a result, Loretta decided to stay at camp. I did not have a dream that night. So I stayed behind , my ego taking another hit. At first, I felt disappointed... coming all this way and not joining the morning dream circle. But I got 3 more hours sleep and I told myself that I would get another chance when we visited with the Sapura people. Those who decide to venture out that night came back with the report that it was not at all what they expected. The dream interpretation was basic: It is going to rain today. Hunting will be good tomorrow. Was this it? I guess I expected something more mystical and profound. Turns out, I did have expectations! It was time to let them go. By the time we were with the Sapura people a few days later, I had let go of all "mystical dream interpretation" expectations. So when I presented my dream to the group, I was ready to receive what Manari, the shaman, had to say. He said: "You see light because you are light." That night I heard Pachamama:"you are here to appreciate beauty and to create beauty. Be open to what comes. You will know what to do"
The second gift: Be open to what comes. We are light. We are here to appreciate beauty and create beauty. We will know what to do. The following is from a presentation at Schumacher College, Totnes, England by Will Keepin, president of the Satyana Institute, Boulder Colorado. Will describes the principles as the beginning of a collective inquiry into how we can apply spiritual teachings in social change work. see every day. Even the most optimistic among us will be affected by the staggering losses and the daily affronts to our values, sensibilities, and even our sanity. It is painful. So painful that sometimes we are tempted to close up rather than live from the heart. Joanna Macy and her "work that Reconnects" asserts that we ought not be afraid of the pain of the world. If you are not afraid of it, then NOTHING can stop you. If you haven't read his book, you are in for a treat. I am unaccustomed to rage. Even as a child, I understood that the game was rigged. Over time, I've become even more aware... though I have had the luxury of not having to think about it all the time--to not have to face it, and the feelings it brings up, day in and day out. All day. Every day. This week has been particularly difficult (the supreme court nomination hearings) and has exposed yet a another level of the rigged game. It brought up in me a deep rage--and I felt it all week in the pit of my stomach... I was struck by the injustice of it all. I felt like throwing up. It gave me the opportunity to imagine what others have felt over generations of systemic injustice. Twenty five years ago, the Aschuar, an ancient indigenous dream culture deep within the Amazon rainforest in South America, began receiving warnings in their dreams. Their ancestral lands were at risk, not only potentially destroying their way of life, but all life, which depends on the rainforest, he lungs on Planet Earth. Receptive people in the North began receiving dreams of people with painted faces. When they eventually met these people, they knew them. The Pachamama Alliance was born. At the invitation of both the Aschuar and Sapura people, we set out on a journey in search of wisdom, a journey that would take us into the heart of the Ecuadorian Amazon rainforest to encounter the wisdom of Pachamama and our own dreams. I've always been fascinated by dreams, the unconscious speaking to us and offering insights and so was drawn to this journey. Pachamama means "Mother Earth" or more precisely "life force of mother earth."